We rescued this guy yesterday from family who had a change of life happen and responsibly enough were able to give him up at 1 year old. 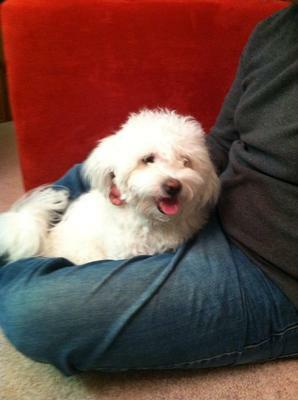 He will be second coton in family as my wife's parents have a 6 year old. He was worth the 6 hr round trip. 1 year old fully trained and housebroken. Comments for New family member Ace! He hasn't met the 6 year old yet but the 6 year old is still full of energy and I CAN'T WAIT till they meet. What a little cutie he is. You are both so lucky and we hope you have lots of good times together. Seems to be a win-win situation for you both. Does he like to play with the 6 yr. old coton? What a handsome little guy. So happy for you and Ace that you adopted each other. As you know, Cotons are the best and the love they have for their families is beyond compare. BTW, he looks a lot like our Molly. Adorable. It looks like u both had an awesome lucky day. Congrats on a new member in the family. My friend rescued 3 dogs over the past few years. Her dogs are the happiest dog I have ever seen. Warmest regards to all your family. Ace looks very happy and peaceful in his new home. God Bless you for rescuing him, and best wishes for lots of happiness with your new family member. How precious and how grateful they must be for you to be able to take him in.